Unified Communications as a Service | 8x8 Inc. | 8x8, Inc. In 2018, Gartner research found small business (50 to 100 users) adoption of Unified Communication as a Service (UCaaS) grew by 14% year-over-year. In the mid-sized business sector of 100 to 1000 users, adoption grew by 8 percent. Gartner's 2018 Magic Quadrant for UCaaS solutions predicts that by 2021, 90% of businesses will no longer buy on-premises UC solutions. Gartner says (and we agree) these are the fundamental elements of Unified Communications solutions. By delivering these services from the cloud as integrated services from the cloud, 8x8 provides our customers with scalable, secure, reliable, and affordable solutions. Is UCaaS Suitable for Your Business? Yes! We serve businesses of all sizes, across all industry verticals. From dental practices, collection agencies and law firms to larger enterprises, such as government organizations, healthcare providers, educational institutions and insurance companies. Software as Service firms like Replicon, Apigee, and Netsuite rely on 8x8 UCaaS services to keep in touch with their partners, colleagues and customers. If your business collaborates internally, communicates with constituents, students or customers, or if you want a UCaaS service which can be enhanced with Contact Center as a Service capability, 8x8 X-Series is the ideal solution for you. As your business grows, or as the adoption of UCaaS expands, it shouldn't be a labor-intensive process for your technical team. Administrators can manage and monitor UCaaS from their mobile device. End users and administrators can access recorded or live training on the 8x8 Academy, so IT can focus on strategic initiatives which drive revenue growth and market share growth. X-Series UCaaS solutions are open and flexible, with supported and documented APIs for interoperability with your existing collaboration and structured data applications. End users across sales, marketing, operations, and the executive leadership team love UCaaS because of its ease of use, interoperability with the apps they use every day, and how it empowers them to work as effectively away from the office as they do in it. IT pros love 8x8 UCaaS because it makes end users happy, is reliable, secure, and offers comprehensive real-time and historical performance analytics. Call activity company-wide for inbound and outbound calls, tracking metrics like talk time, abandon rates and even ring time. These analytics are valuable not only to understand how UCaaS is working across your company and around the world but how the people who are using Virtual Office and X-Series are performing over time, or right now. 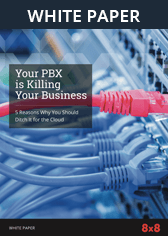 Are you managing a physical PBX or multiple PBX systems in your data centers or office closets? How much could you save if you replaced that/those PBX boxes with a cloud-hosted one? What are your ongoing long-distance, cellular call service overages or toll-free number fees like? Does your business need to pay to call your offices across the country, or across the ocean? Can your on-premises Unified Communications application integrate with other apps in your technology stack, like CRM, email, and calendar? How much is it costing your business to run UC in-house? If you are building a business case for UCaaS, and need help quantifying the financial and strategic benefits of deploying cloud-based, omnichannel digital communications across your company, check out our ROI calculator. If you are a public sector organization, such as a hospital or a government agency, we've created some great RFP-building resources to make your life easier.